Sheikh and el Qurna: Traditional mud construction within the hamlets prior to demolition. Photo: Caroline Simpson. Sheikh Abd El Qurna: What Happened Next? American Recearch Center in Egypt’s Qurna Site Improvement project (QSI) was developed as an intiative to record and solve the problems arisen by the demolition of the hamlets housing people in the ancient necropoleis of Sheikh Abd el Qurna and el Khokha (Luxor), the inhabitants’ moving and the economic crisis that followed the 2011 Egyptian Revolution. Human habitation in this area has been a contentious issue for a long time, given the fact that the area’s modern buildings were constructed atop a large number of ancient tombs. Government plans to relocate the people living in the area, in fact, have been debated since the 1940s. This debate was made famous by Hassan Fathy’s New Qurna village, which stood as a physical reminder of the concept of relocation for the past 70 years. A number of motivating factors ultimately prompted the removal of the buildings from the area. One of the goals of the demolition campaign was to remove buildings viewed as modern from the nearby ancient tombs. However, as demonstrated by Dr. Kees van der Spek in his work The Modern Neighbors of Tutankhamun, issues of human settlement in the area and separating ancient from modern material are complex. The Theban foothills have been used for habitation by local populations at least as far back as the 1600s, when the records of contemporaneous European travelers commented on people living in and around the tombs. From the records of explorers in the 1700s and 1800s, we know that people living in the village that was located in the Seti I Temple had a long-standing tradition of migrating from their houses, close to the cultivation, to the tombs in the Theban foothills. They would do so in the summer, when the tombs offered relative cool compared with their village houses; in times of military insecurity, as the tombs offered better protection; and when the inundation made living close to the irrigation undesirable. Dr. Van der Spek argues that the first houses in the foothills were built by Europeans as bases for their archeological and collecting operations. 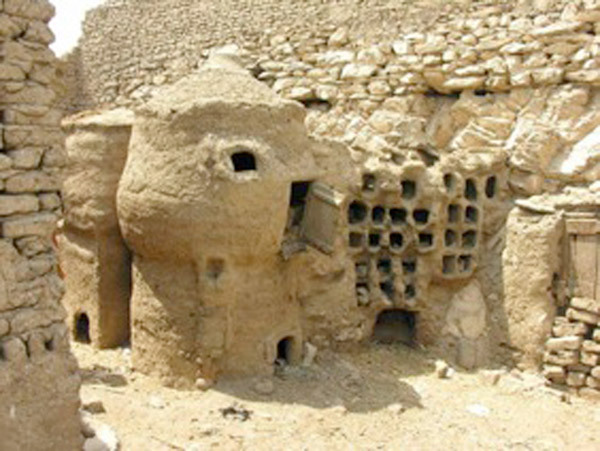 These examples of above-ground dwellings in the area were likely followed by the local population, who incorporated tombs possibly already used by families.The result, starting in the mid to late nineteenth century, was the development of permanent buildings and communities intertwined with the area’s ancient tombs. This history of building at Sheikh Abd el Qurna and el Khokha means that sorting what is categorized as ‘ancient’ from what is categorized as ‘modern’ is far from straightforward. The hamlets of Sheikh Abd el Qurna and el Khokha were finally destroyed between 2007 and 2010, and the people that had been living there were relocated further north and east.The destruction of the last hamlets left large portions of the UNESCO World Heritage site in visual disarray, with debris piles and the remains of partially demolished buildings in and around tombs open to visitors. At the same time, employment estimates suggested that 70% of Luxor locals were either directly or indirectly economically tied to aspects of the tourism industry. Historical coincidences did not help. A bit more than six months after the last neighbours of teh pharaohs left their homes in the Theban necropolis, the 2011 revolution took place, bringing along security problems and the collapse of tourism industry that lasts until now. With the collapse of tourist industry after the revolution, local populations, particularly those on the West Bank, faced hardship. Funding provided through USAID enabled the creation of a large programme of work that, in part, addressed both of these concerns. – To put Egyptians back to work after the economic crisis that followed the Egyptian revolution. The larger program of work, of which the QSI project forms a part, offered a means of employment for approximately 700 people in a variety of capacities. The QSI project itself aimed to employ approximately 600 workmen, many of whom lived, or had ties to people who lived, in the hamlets in Sheikh Abd el Qurna and el Khokha. – To improve the general appearance of the area of Sheikh Abd el Qurna and el Khokha, by removing, by hand, the loose debris left by the demolition project. – To record the remains of the hamlets in an archaeologically sound manner. – To offer archaeological and conservation training programs to Ministry of State for Antiquities Affairs (MSAA) inspectors, as well as on-site work training for laborers. – To improve visitor access to the monuments by providing non-invasive pathways. – To provide security lighting for the non-invasive pathways.